We’d love your help. Let us know what’s wrong with this preview of A Previous Engagement by Stephanie Haddad. Tessa Monroe knows how to do exactly two things: climb her way up the corporate ladder and cheer up her best friend Christian Douglas, the main man in her life since paste was a snack. With the exception of a Ring Pop proposal and a pool-side kiss in college, not much has changed between them in 25 years. Now that they’re all grown up, the two friends find themselves heade Tessa Monroe knows how to do exactly two things: climb her way up the corporate ladder and cheer up her best friend Christian Douglas, the main man in her life since paste was a snack. With the exception of a Ring Pop proposal and a pool-side kiss in college, not much has changed between them in 25 years. Now that they’re all grown up, the two friends find themselves headed down two different paths: Tessa looking for her dream job and Christian looking for his dream girl. To ask other readers questions about A Previous Engagement, please sign up. Oh. My. God. This was terrible. It was absolutely terrible. The heroine was unlikeable. That's just the best way to put it. She was just unlikeable. Not a terrible person, but just someone I could never imagine myself rooting for. She was just u Oh. My. God. This was terrible. It was absolutely terrible. The heroine was unlikeable. That's just the best way to put it. She was just unlikeable. Not a terrible person, but just someone I could never imagine myself rooting for. She was just unlikeable. The supporting cast was lackluster at best and annoying at worst. And there were a lot of supporting characters - too many, in my opinion. There's a fine line between an appropriately sized supporting cast that mitigates the feeling of the hero and heroine existing in their own little bubble, and a supporting cast that is so large as to just be annoying and dilute the story. The dialogue was ... cheesy and try-hard. The dialogue tried too hard to be cutesy and original, reminiscent of Juno. It was a wonder that I could even read it, given how hard I was rolling my eyes. Although a tale as old as time itself, the author breathes life into her characters, and I practically experienced a New England Spring, and walked in the marbled halls of Prime Investments with Tess as she applied he Goodbye Yellow Brick Road ... Like many of us who yearn for somewhere over the rainbow, Tess Monroe discovers that happiness and her heart’s desire can be found in her own back yard. This was a light and not so thrilling story. Our main protagonist, Tessa, is a workaholic and her life depends on her job and her career. She has two really close friends and one of them is Christian. While Tessa tries to show her talent and how much her job means to her, Christian breaks up with his fiancée and now he is searching for a new woman aka wife, as he is so determined to get married. Firstly, the way the story begins is very pleasant and happy an cute, but I don't think 5 year old -th This was a light and not so thrilling story. Our main protagonist, Tessa, is a workaholic and her life depends on her job and her career. She has two really close friends and one of them is Christian. While Tessa tries to show her talent and how much her job means to her, Christian breaks up with his fiancée and now he is searching for a new woman aka wife, as he is so determined to get married. Firstly, the way the story begins is very pleasant and happy an cute, but I don't think 5 year old -there are supposed to be 5 right?- talk that way. It brought a smile on my face the way Christian tried to reveal his feelings but it really didn't felt that real for a 5 year old. I love how their relationship and friendship managed to stay healthy all these years but seriously how could they not see that they liked each other earlier? I mean they had their moments in the past and they thought that there wasn't anything else there, just friendship. That was unrealistic as well. Tessa was really hard on herself and i didn't like many of her decisions. I liked her but also i didn't. She was do caught up with work and her career, which is good , but she didn't allow herself to have fun and enjoy the things around her. I didn't like Christian's character along the way. At first I felt sorry for him, for his break up, his struggle with his feelings but he was always pushing Tessa, especially in the end. The dude just wanted to get married and he didn't care who his wife would be. Thats the idea i got. He pretty much confirmed my statement at his birthday party. And her friend, wasn't very likable either. If you know that you friends have feelings for each other you say or do something, and you cant possibly remain oblivious to your friends obliviousness. It was one of the books that i think that would look better in a movie concept. It would have been a good movie , with the romance and everything, because the story was movie material and it wasn't a good story for a book. Either because of my testicles or because I'm just that way, I avoid romances. They seem to only be possible when incredibly stupid people are the characters. The main character in A Previous Engagement (a clever title, by the way), fits the category perfectly. I thought the male paramour did as well until I was most of the way through the book. Then I realized he wasn't suffering from a series of major concussion, he was just overly sentimental and emotional for a man. Definitely not a man's ma Either because of my testicles or because I'm just that way, I avoid romances. They seem to only be possible when incredibly stupid people are the characters. The main character in A Previous Engagement (a clever title, by the way), fits the category perfectly. I thought the male paramour did as well until I was most of the way through the book. Then I realized he wasn't suffering from a series of major concussion, he was just overly sentimental and emotional for a man. Definitely not a man's man, but perhaps he fits with the modern metrosexual kind of guy that's become so popular. I prefer the 80's action movie hero kind of guy. Or The Duke. One other thing bothered me - the book leaves the impression that it's unfavorable for a woman to have a successful career. The main character strives to do so, but she's not complete without a partner and family in her life. I find that a flawed lesson. Why should a person be required to have a family to be complete? That's the bad, here comes the good. The book was very well written. The main character amused me time and again (when she wasn't aggravating me by being oblivious), thanks to the author's skill with putting words together. I faintly remember one chapter starting with a sentence that was too long and made no sense, but I was able to move past it easily and find no other flaws. Coming from another writer, that's a major success. I read the book in a matter of hours, another feather in Stephanie's hat. I abhor the genre yet she kept me reading. I wanted to reach in and strangle the characters because they seemed to be inexplicably stupid from the very beginning, but still I read on. I say 'inexplicably stupid' but that does not mean they are without precedent. Virtually any romance movie available or even some distant relatives of mine have displayed similar or near exact levels of ignorance and dumbassery. So yes, I thought they were dumb but it's a dumb that I've seen many times before in fiction and in fact. For someone who enjoys the genre, I recommend the book highly. 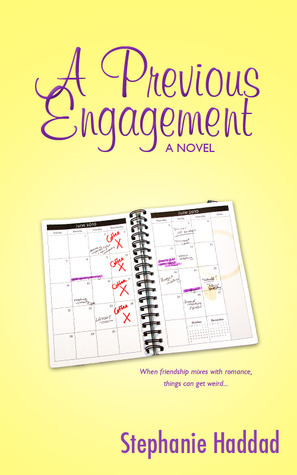 A Previous Engagement is very typical, predictable chick lit. The reason that I can't give it more than two stars, is that there was really nothing at all unique or surprising in this story. In fact, the miscommunications that occurred to keep the two main characters, Tessa & Christian, apart, were so predictable that it wasn't even interesting. In fact, if Tessa & Christian had actually ever talked or acted like the almost 30 year old adults they were supposed to be, there would have be A Previous Engagement is very typical, predictable chick lit. The reason that I can't give it more than two stars, is that there was really nothing at all unique or surprising in this story. In fact, the miscommunications that occurred to keep the two main characters, Tessa & Christian, apart, were so predictable that it wasn't even interesting. In fact, if Tessa & Christian had actually ever talked or acted like the almost 30 year old adults they were supposed to be, there would have been no story at all. The book also seemed to have a lot of filler that served no purpose except to make this story long enough to publish as a novel. For example, one of the reasons given for Tessa being so career focused, was that she didn't want to end up like her mother. Well her mother was a very minor character, and if she was supposed to have been a bad mother, I didn't see it except for some random references throughout. Tessa's lesbian sister was also introduced and could have been interesting, but her role in the book was completely marginalized. I think I ultimately enjoyed this book so much because I could relate to it. My best friend growing up was a boy. No one could understand how we could be friends and nothing more. It caused issues in many of our relationships, often times requiring one of us to fade into the background for the other persons happiness. We, however, remained only friends through the years and are now both happily married to other people. That doesn't stop me wondering what might have been. This book let me delve into I think I ultimately enjoyed this book so much because I could relate to it. That doesn't stop me wondering what might have been. This book let me delve into the fantasy a bit, albeit in an over the top romantic way. I enjoyed the fact that the book focused on these decisions, and sometimes sacrifices, we make in our lives. Tess, struggled with the decision of being a career woman or settling down. It took her a bit too long, in my opinion, to figure out that settling down wasn't the same as settling. Book number 6 of the year. A previous engagement by Stephanie Haddad. I gotta be honest and say that the first thing that I noticed about this book was that it was for free on kindle, but what a great book, it's just fun and a good read really, there's a lot of romance and friendship all that things that make this book and excellent read for girls, I read it in about a day and a half and left me wanting to read other works by this author. I absolutely loved this book!! It was such a nice light read and I really found myself sucked in. I loved how much the Tess and Christian showed their emotions and just how connected the two of them were. I found myself really feeling for the characters, more than I ever have before. I really want to check out more books from this author, I didn't want this one to end! I was lucky and won this book as a giveaway here on goodreads. I'm so glad that I did cause I LOVED IT! After the first chapter I did not want to put it down! I loved all the characters and am sad that the book is over! I could have read on and on to find out what happens to them! This is one of several free or almost free books I downloaded to my Kindle. It was a fun quick read. Fairly predictable but still lots of fun.. Not generally a fiction reader so I was suprised. I am not huge on romance books but a surprisingly wonderful read, I still want to know more like whether she persued a case against her boss's advances. I was swept away loved it. A good book (that was free on Amazon!) about friends who have been in love with one another their whole lives, but are too afraid to come clean. Cute fast light romantic read. Definitely one of the better free books I have grabbed off of Amazon. I just finished reading this one, and it was a fun and easy read. Some parts made me laugh out loud, and the dynamics of Christian, Tessa and Kendra is fantastic. A great read! This book has great characters that you'll want to care about, but it's also clever and funny. It's a good balance of comedy and romance that even non-romance readers will enjoy. Typical easy read, "girls" book... A quick read to pick up on the weekend to pass the time. Typical romantic ending! Found it on iBooks for free and decided to try it out on my iPod. This review has been hidden because it contains spoilers. To view it, click here. Mostly clean romance. It was funny. However, I had issues with a couple things. First, the main character, Tess, didn't tell her friends she was moving away even though she was in a relationship, and she only had two weeks' notice for it. The fact that she was unable to act like a mature adult and disclose her promotion and impending move to her friends was really weird. I wondered about her mental health. Second, Christian moved in without even discussing it with her first. Just so weird. Third, Mostly clean romance. It was funny. A fun read. The humor was genuine and the friendship between the characters was believable. I will be looking for more books by this author. Tessa and Christian have been best friends since they were small children. With a long and strong friendship like theirs you would think nothing could tear them apart. Unfortunately, both Tessa and Christian are looking for different things in life. Their struggle with getting everything they want is just the thing to test their friendship. Tessa is trying to be fully focused on work. She wants to build a great career and Christian is ready to settle down. His plans now entail finding the girl for him. When Tessa decides to be the good friend she knows she is things begin to take a turn that anyone can see coming. At first I really liked Tessa. She just seemed cool but as the story progressed my opinion of her wavered. I didn’t dislike her completely but how she handled things sometimes were annoying. You just want to smack some sense into her. It is nice have a goal, something to strive for. Tessa has her goals and is an independent women but that isn’t all their is to life. She didn’t think much about how she might balance things. She just took the stand that she could only have one thing. Christian on the other hand was adorable with his wanting to have a family of his own. He decided it was time and wasn’t scared of making a commitment. Although this was nice he wasn’t much better then Tessa with his actions. He knew what he wanted but didn’t full on try to get it. He was looking like he was going to just be willing to settle without too much of a fight. This review has been hidden because it contains spoilers. To view it, click here. Hmm. This was a free Kindle novel and I'm all for free Kindle novels. I've read better and I've read worse. This story was odd. As other readers have stated, the main character (Tessa) is a little unlikeable, but I'll blame that on the fact that she doesn't really develop during the story at all. We just jump right into the story without getting to know Tessa very well (sure, extreme clumsiness is cute, but that doesn't make me want to root for the protagonist), so it's difficult to stand by her Hmm. This was a free Kindle novel and I'm all for free Kindle novels. I've read better and I've read worse. This story was odd. As other readers have stated, the main character (Tessa) is a little unlikeable, but I'll blame that on the fact that she doesn't really develop during the story at all. We just jump right into the story without getting to know Tessa very well (sure, extreme clumsiness is cute, but that doesn't make me want to root for the protagonist), so it's difficult to stand by her while she remains the most obliviously stupid character in free e-book-dom. Until she manages to realize she likes Christian (which really shouldn't be a spoiler, seeing how predictable that scenario is) I wondered if Tess even recognized the emotion of love. Seriously. Who is that blind to a relationship that's been building for 20 years? After she and Christian finally get together, Tess doesn't even tell him she's moving to Chicago in less than two weeks for a promotion (and to get away from Christian so as not to hurt him...when she also knows full well that she's going to hurt him by moving. What?). Way to be an adult. I understand it's a difficult conversation to have, and I know it would be initially weird to date someone you've been friends with since you were 5, but Tess should have more gumption than what she shows in her private life. I didn't see a connection between Tess' two lives - she's a success as a hardworking marketing VP (which she does so well) but is completely unable to recognize, much less go for, what she wants in her private life...that was what bugged me most about this novel. This review has been hidden because it contains spoilers. To view it, click here. In searching for free books for my Kindle, I stumbled upon this one. I have to say - for free, it's a bargain, especially compared to the other free books I've encountered. It's entertaining, and a fast read. The plot is predictable, the characters fit a bit too nicely into their molds, and Tessie's inability to realize how Christian feels is hard to swallow. I spent a good part of the novel rolling my eyes because, come on - he did everything short of screaming it at her. That said, the writing In searching for free books for my Kindle, I stumbled upon this one. I have to say - for free, it's a bargain, especially compared to the other free books I've encountered. It's entertaining, and a fast read. The plot is predictable, the characters fit a bit too nicely into their molds, and Tessie's inability to realize how Christian feels is hard to swallow. I spent a good part of the novel rolling my eyes because, come on - he did everything short of screaming it at her. That said, the writing style is fluid and very readable. The dialogue is believable. The relationships are strong and also believable, for the most part. I easily fell in love with Christian. Had the on-again/off-again relationship between Tessie and Christian been tamed a bit, I'd have given this four stars for sure. Stephanie Haddad’s earliest works featured unicorns and talking pumpkins who overcame adversity, evil, and the threat of being baked into pies. With age, her writing has evolved to more grown-up topics, like love and the complicated relationships between people. As a life-long lover of cheerful fiction, she strives to tackle real-world issues with wit, hope, and lots of humor. Her short stories ha Stephanie Haddad’s earliest works featured unicorns and talking pumpkins who overcame adversity, evil, and the threat of being baked into pies. With age, her writing has evolved to more grown-up topics, like love and the complicated relationships between people. As a life-long lover of cheerful fiction, she strives to tackle real-world issues with wit, hope, and lots of humor. Her short stories have spanned many genres, but her full-length novels stay firmly planted in happy endings, via both romance and women’s fiction.